Wouldn't it be cool to experience the history of percussion instruments instead of just reading about it? To see and hear yourself how music was like back in ancient times? Well, you can! Many of our modern instruments have roots in Africa. 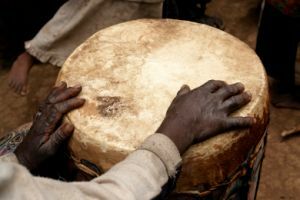 Africans brought their drums and rhythms to the West during slave trade. Most modern music styles have developed and evolved from that. But back on the African continent itself, those ancient instruments and their traditional use have not changed much. Watch a craftsman making a drum, rattle or xylophone. He collects and uses natural materials that are available in his village: Hallowed out tree trunks, animal skin, dried seeds, gourds and shells etc. No fiber glass, not synthetic drum heads, no factories, no mass production! Like in the old days, he crafts each instrument completely by hand, using simple tools. This still gives African instruments that ancient feel, look and sound. In the West, modern technology has completely replaced instruments as a means of communication. But listen to the drums in Africa! They still transmit encoded messages between villages or call the people to gather. Many instruments not only give signals, but actually "speak" the people's language! These are called talking drums, while some tribes even have a talking xylophone. During rituals, Africans call upon their ancestors for advice. The deep sounds of udu drums are believed to be their answering voices. The myth of the Sosso Bala tells the story of the first African balafon. Great kings used it to communicate with spirits and to tell the future. Attend an African wedding or funeral and you'll see percussion instruments in action. They are part of any life passage and religious ceremony. 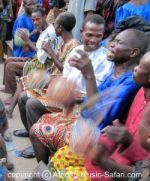 Visiting Africa to study the traditional music is like traveling back in time. You'll rediscover purposes of percussion instruments, that have long been lost in our culture. You don't have the possibility to travel to Africa? Then find some authentic African instruments and play yourself! This is the best way to connect to the roots, to get a feel of the history of percussion instruments.